Juventus scored two late goals to make it six Serie A wins in a row and boost their title hopes with victory over fellow contenders Fiorentina. The visitors led through Josip Ilicic's third-minute penalty but on-loan Chelsea winger Juan Cuadrado equalised for the champions with a header. Mario Mandzukic and Paulo Dybala scored in the final 10 minutes to take Juventus fourth - six points off top. Second-placed Fiorentina are four points behind leaders Inter Milan. The drama began early when Giorgio Chiellini was penalised controversially for tripping Federico Bernardeschi and Ilicic converted the penalty. But the home side were level just three minutes later when Cuadrado's header looped over goalkeeper Ciprian Tatarusanu. Juventus went ahead in the 80th minute when Mandzukic pounced on a rebound and found the roof of the net after Tatarusanu could only parry Dybala's shot. Dybala completed the scoring with a cool finish in the first minute of added time. Leaders Inter 4-0 at Udinese on Saturday. Roma drop to fifth behind Juventus after drawing 0-0 at third-placed Napoli. 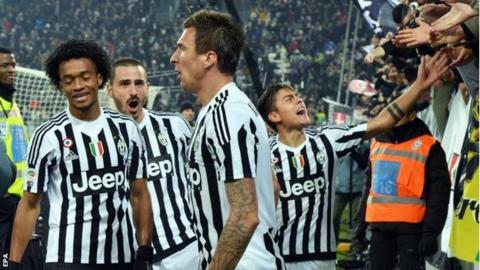 Match ends, Juventus 3, Fiorentina 1. Second Half ends, Juventus 3, Fiorentina 1. Attempt missed. Milan Badelj (Fiorentina) right footed shot from outside the box misses to the left. Assisted by Federico Bernardeschi. Manuel Pasqual (Fiorentina) wins a free kick in the defensive half. Goal! Juventus 3, Fiorentina 1. Paulo Dybala (Juventus) left footed shot from the centre of the box to the bottom left corner. Assisted by Juan Cuadrado. Manuel Pasqual (Fiorentina) is shown the yellow card. Foul by Manuel Pasqual (Fiorentina). Federico Bernardeschi (Fiorentina) wins a free kick in the defensive half. Borja Valero (Fiorentina) wins a free kick in the defensive half. Offside, Fiorentina. Gonzalo Rodríguez tries a through ball, but Nikola Kalinic is caught offside. Substitution, Juventus. Álvaro Morata replaces Mario Mandzukic. Substitution, Fiorentina. Giuseppe Rossi replaces Matias Vecino. Substitution, Fiorentina. Matías Fernández replaces Josip Ilicic. Substitution, Fiorentina. Manuel Pasqual replaces Marcos Alonso. Attempt blocked. Mario Mandzukic (Juventus) left footed shot from the left side of the box is blocked. Corner, Juventus. Conceded by Marcos Alonso. Corner, Juventus. Conceded by Ciprian Tatarusanu. Attempt saved. Stefano Sturaro (Juventus) header from the centre of the box is saved in the centre of the goal. Assisted by Juan Cuadrado with a cross. Corner, Juventus. Conceded by Nenad Tomovic. Goal! Juventus 2, Fiorentina 1. Mario Mandzukic (Juventus) right footed shot from the centre of the box to the top right corner. Attempt saved. Paulo Dybala (Juventus) left footed shot from the centre of the box is saved in the centre of the goal. Assisted by Paul Pogba. Foul by Matias Vecino (Fiorentina). Substitution, Juventus. Alex Sandro replaces Patrice Evra. Attempt missed. Milan Badelj (Fiorentina) right footed shot from outside the box misses to the left following a set piece situation. Claudio Marchisio (Juventus) is shown the yellow card for a bad foul. Borja Valero (Fiorentina) wins a free kick in the attacking half. Matias Vecino (Fiorentina) is shown the yellow card.